The purpose of this attachment is to cut small drains in milled peat fields from the centre of the field to the ditches separating the fields. The attachment consists of a cutting boom which is mounted on the rear of the H.D. Tractor Type II on radius arms, controlled for height and level by hydraulic rams. A Roller fixed to the boom and running in a vertical guide attached to the tractor frame takes the cutting thrust. 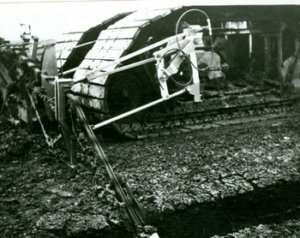 To cut the drain, the tractor is stopped and the cutting boom started, trimmed for level if necessary and lowered into the bog, discharging the spoil to the centre of the field. The boom is of light construction using standard steel sections and around this frame runs a standard transmission chain to which is welded cutting plates. The chain is carried on sprockets at the ends of the boom while it runs in a guide with the aid of welded-on cleats along the bottom horizontal portion of the boom. The drive is taken from the P.T.O. shaft of the tractor main gearbox via chain drivers and universal jointed propeller shaft.